PRO16+ HD FPV Drone - Free CDN Shipping Available! 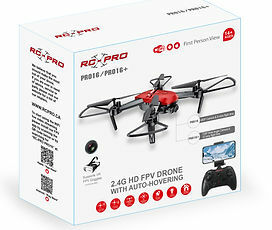 The PRO16 and his stronger brother the PRO16+ brings everything you can ask from an entry level drone with a price point anyone can afford. Updated with an attractive 2018 design and equipped with a modern 2018 Auto-Hovering boards, these models features flight stability and hovering accuracy which will allow any user to fly in ease right out of the box. We also added a 1 button Automatic Takeoff/Landing feature In order to avoid takeoff and landing mistakes in the beginner learning stage. * WiFi Live HD 720*1280P Wide-Angle video streaming via RC-PRO APP for Android or IOS.